Online voting for the CBC Viewers' Choice award for the New Brunswick Innovation Foundation’s (NBIF) Breakthru competition is now open. UNB is showing its research and entrepreneurial strengths at this year’s Breakthru competition with four of the five finalists being UNB groups. James Stewart, a PhD student in information technology at UNB Saint John, is the founder and chief executive officer of RTV, which stands for Repeat Target Vehicles, a start-up developing predictive analytics software that can identify for police departments people who are likely to drink and drive. Black Magic, a company created by chemical engineering students, Greg Bailey, Garrett Nelson, and Stephen Likely, is commercializing a solution, which was invented by Frank Collins, assistant dean in the department of chemical engineering at UNB, to get grease and grime off your hands. Most heavy-duty hand cleaners are toxic, and have abrasives that basically scrape the dirt from your hands. Black Magic’s two-step, non-toxic solution, will take any oil-based substance off of your skin. Civil engineering student Coady Cameron and MBA student Drew Cameron know that managing pavement systems is expensive. Their company, Total Pave, is developing a smartphone app that allows engineers to acquire and wirelessly report the Pavement Conditions Index and International Roughness Index. Its price, speed and updatability will save governments thousands of dollars. This technology was born from UNB's Dr. Trevor Hanson's Introduction to Pavement Management undergraduate course, and is now being further developed by Coady as part of his master's in civil engineering which is being co-supervised by Dr. Hanson and Dr. Eric Hildebrand, Professor, of the UNB Transportation Group. CeteX is a new, efficient wastewater management system created by chemical engineering student, Greg Armstrong and his brother Nathan Armstrong, who is enrolled in business administration. Wastewater treatment has been around for decades with little change. Many companies cannot flush wastewater into the public sewage system. CeteX’s small, on-site wastewater treatment system has demonstrated considerable demand. Plus, their novel process supplies enough residual biogas to make the treatment process energy neutral. CeteX is being supported and mentored by Dr. Kripa Singh, professor with the department of civil engineering at UNB. UNB's Office of Research Services (ORS) has been working closely with faculty inventors to protect and commercialize some of the new technologies being launched at the Breakthru competition. Many of the Breakthru finalists are enrolled in the Dr. J. Herbert Smith Centre for Technology Management and Entrepreneurship (TME) – a diploma program that helps get student ideas off the ground and works very closely with the International Business and Entrepreneurship Centre (IBEC). The partnership between UNB’s ORS, TME and IBEC has resulted is several companies like, KnowCharge, SmartSkin and SceneSharp; just to name a few. 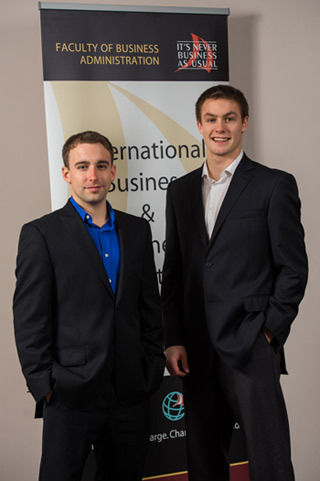 Breakthru is a bi-annual business plan competition that seeks to start up three new growth companies in New Brunswick. Hosted by NBIF and Cox & Palmer, competition finalists will compete for over $406,000 worth of cash investments and professional services on March 20, 2013.